Here’s a recap of the newest X-Men hardcover and trade paperback collected editions from the blogger who owns almost every one ever published! Let me tell you, that’s a lot of collected comics! Since this is my first column, I’m going to recap new releases from the whole month of July. Whether you’re a major X-Fan or a casual reader, I’ll tell you what’s worth picking up. If you have any questions, just let me know – I own the vast majority of these books, and I’m happy to help. This is a supplement to my Definitive Guide to Collection X-Men in Graphic Novels, which tells you how you can buy any X-issue ever printed. Ever. But if you’re new to X-Men in comics form, you should read my recent Intro to X-Men (on a budget) post. Collects Daken: Dark Wolverine #5-9, X-23 #7-9, and the Daken/X-23 story from Wolverine: Road to Hell. CK Says: Buy it! This hardcover has some heft to it in both page count and story, and it doesn’t require a lot of prior knowledge to enjoy. It introduces Wolverine’s amoral, bisexual, illegitimate, villainous offspring Daken to the criminal underworld of Madripoor. 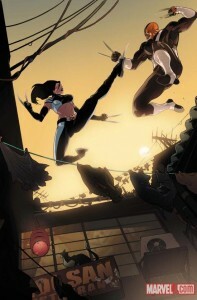 Meanwhile, Wolverine’s increasingly-less amoral, teenage, female clone X-23 and her chaperone Gambit wind up on Madripoor’s shores as well, hunting a connection to the Weapon X program.